The files on your Mac are managed by the Finder. 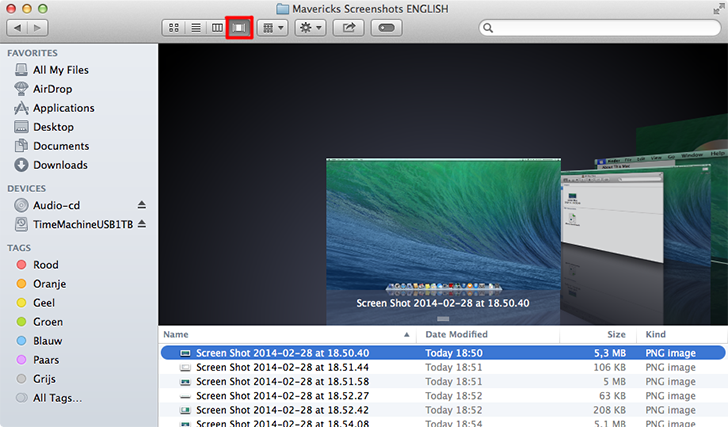 The Finder uses so-called Windows to show you what the contents of your Mac are. 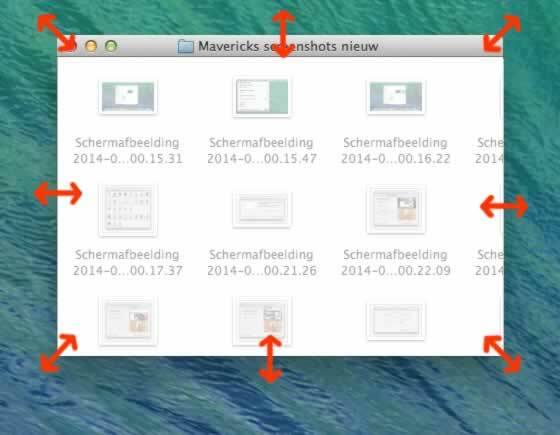 You can choose the way the Finder arranges these windows. See what you find most useful. 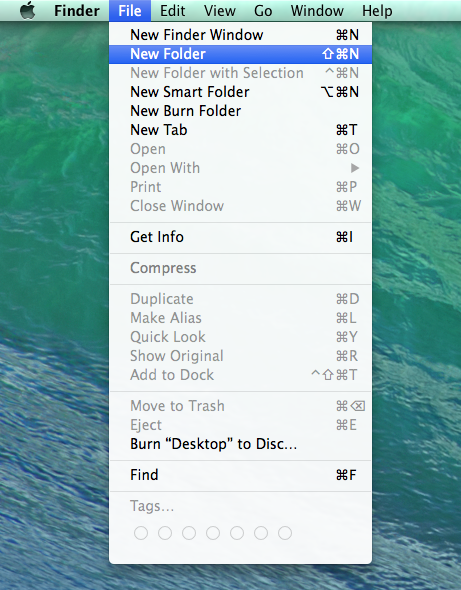 You can use the Dock icon from the Finder to open a new window: by clicking on it once. 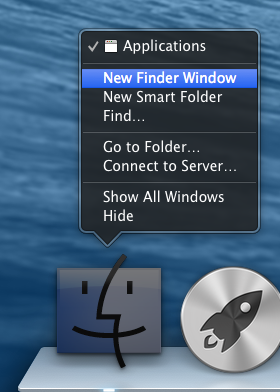 NOTE: also double-clicking on a disc/hard drive/usb stick on your desktop always gives you a new Finder window. At the top you can see the Toolbar and at the right the Search window. At the left you have the Sidebar. You can enlarge a window on all sides. 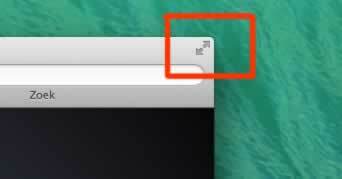 Drag your mouse on the edge or corner of the window until a double arrow appears. Now click and drag the window to the desired size. 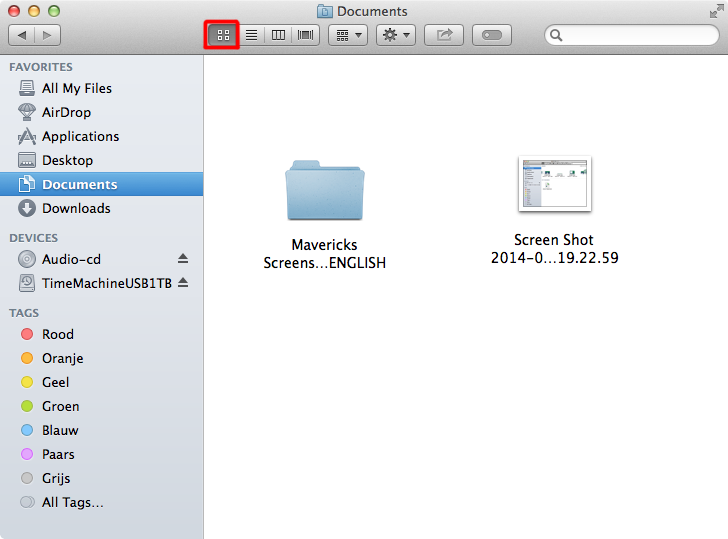 There are four ways to show the folder hierarchy: Icons, List, Columns, and Preview. At the top left of the window you can see four symbols that express this. Click it and the layout of your window changes. 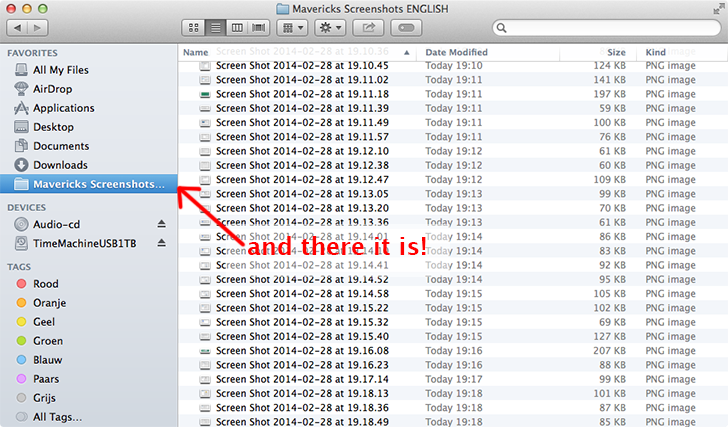 So you see thumbnails of your files and folders. You do not need to start a program to view and / or listen to documents. This is very useful if you are looking for a file. 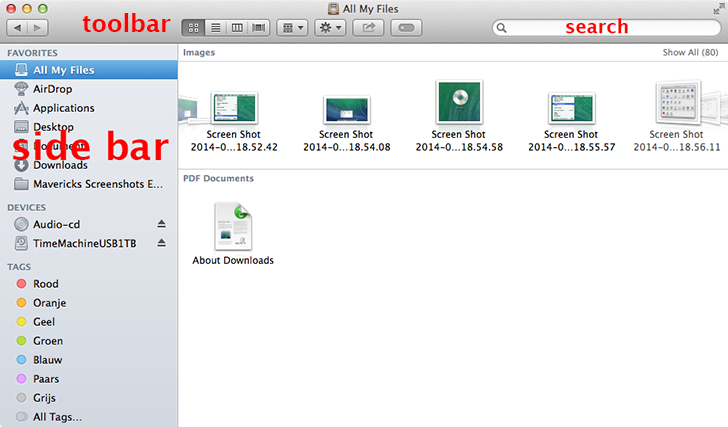 The Finder is more than just a Folder - Structure - Management Program: it is also a Preview Program! 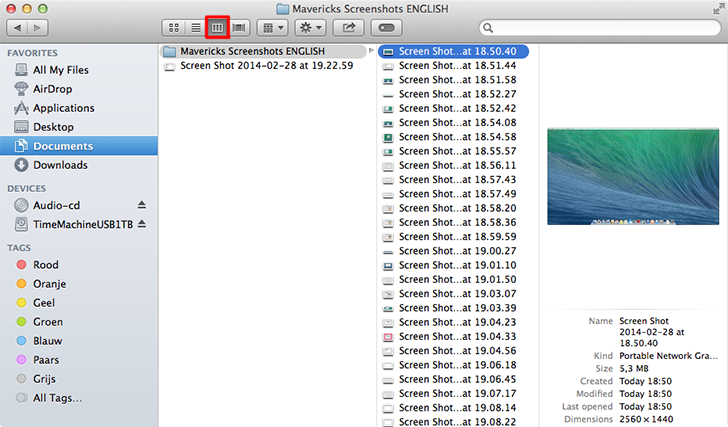 Besides the Preview view is there is a way to see without having to open a program your files: Quick Look. Use the upper right button to display the image full-screen. This means that you enlarge the window as big as the screen. 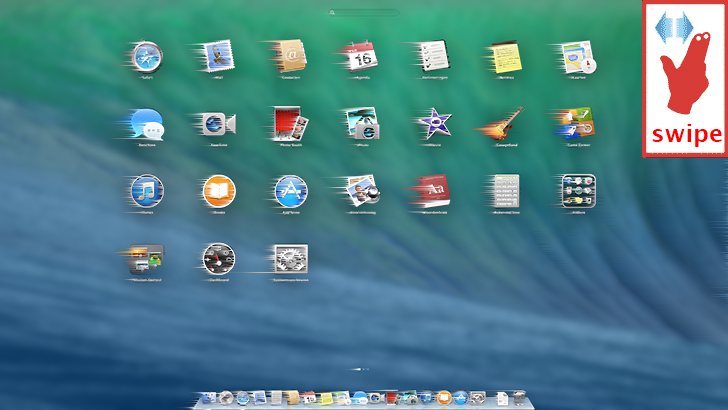 It may be that this makes the menu bar and Dock disappear temporarily. To return to the display window, move your mouse to the upper right back. The menu bar will appear with a blue icon. Click on it and the screen display disappears. This can be found under File => New Folder. 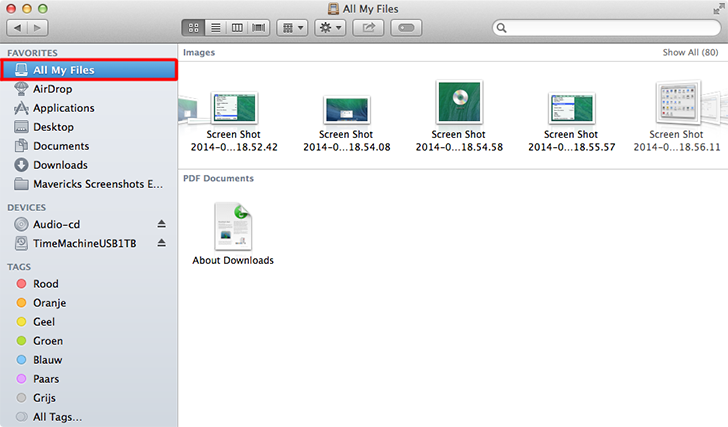 If you want to put multiple files instantly into a new folder: select all files and right-click for a pop-up menu. Choose New Folder with Selection (x components). Convenient ! Of course you can move files . Click on it, hold down the mouse button and drag the item to where you want it. Do you want to copy the file too, then simultaneously hold down the Option key . You'll see a green ball appear to indicate that you're making a copy. Press the Shift-key and select the first and last one for files in a row. For files in various places, use the Command key. 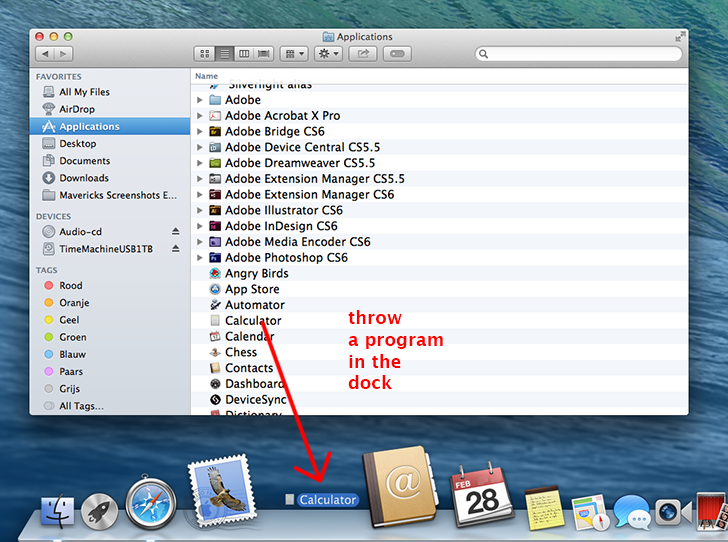 You can use the Dock as quick stepping stone to your favorite programs, folders or documents. Another possibility is to use the menu that you find to the left of each window: the Sidebar. Drag herein your favorite folders, programs and / or documents. An Alias will be created: a link to the real file. Apple has already placed some folders inside the Side Bar. Better let them be, because many programs (iPhoto, iMovie, iTunes, etc.) use them. Drag and drop a folder or document to the Sidebar. You can now open this folder in one click. 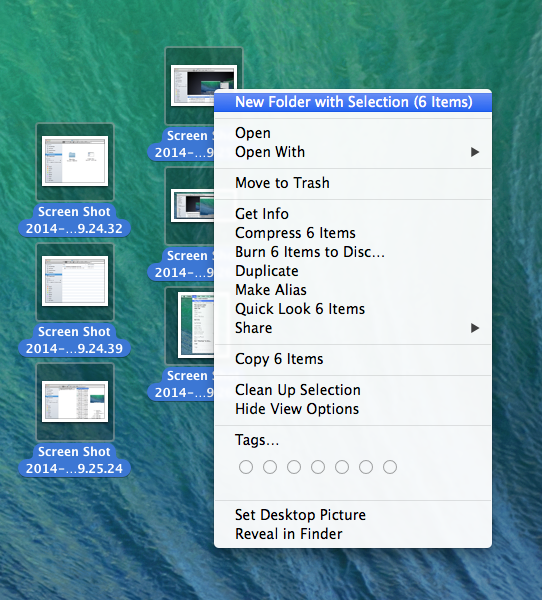 You no longer need to go through the entire folder structure. Convenient! Right - click and choose 'Remove from Sidebar'. Note that only this reference will disappear. You do not throw away the original. NOTE: Better leave the default folders in the Side Bar alone. At least never throw away the originals! At the top of the Sidebar, at All My Files, you can move through all your pictures, movies, music and documents. At icon view you can easily see what documents you have. CDs, DVDs, flash drives and other external data storage will also appear in the Sidebar, at DEVICES. In addition to the disk you find an eject icon. Before you disconnect a drive , you must always eject it like this. This also applies to USB sticks! Note that you always have to remove an USB stick like this before for you pull it out of the computer - even under Windows! Many people (mostly windows users) do not comply to this rule, but you can damage your data if you keep doing it! When you place a music or video disk in your Mac, the programs for audio play (iTunes) and video play (DVD player) will automatically start up. You can change this in System Preferences => Cd's & dvd's. Double-click on a file to open it. The file will choose a program to open. Move your mouse upon an icon and you'll see the name of the program appear. Click to run the program (the icon will start jumping). Or to indicate that it should open after your Mac has booted 'Open after login'. Convenient! As in the Sidebar, we drag our favorite programs or documents to the Dock. The great thing about the Dock is that you always have direct access to it, no matter what you're doing. 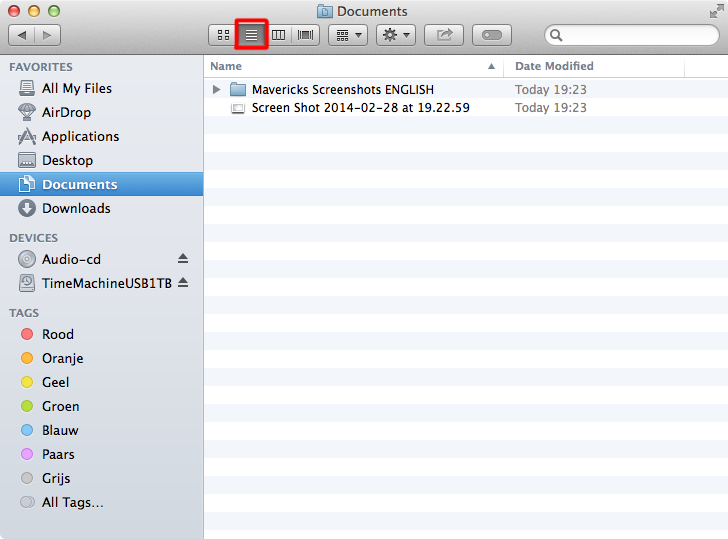 For example, the System Preferences from the previous chapter, which are also directly accessible from your Dock . The Dock is a go-to-it-fast thingy. Useful for all your programs, but also for frequently used documents and folders. Want to add something to the Dock ? Drag the file to the Dock and then drop. There is now an alias created, or in other words a shortcut to the file. To remove an item, pull it quickly from the Dock. It will dissolve in a dust cloud . This is NOT the program itself that disappeared, only the Dock reference. So there is no reason to panic when you drop anything from the Dock accidentally. Just search the original file and drag it back. 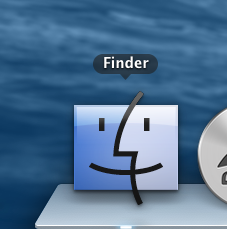 NOTE: Some icons cannot be removed from the Dock, for example the Trash and the Finder icon. Copied from the iPad / iPhone, and in favor of a Trackpad is Launchpad. Here you will find all your programs. Use your Trackpad to swipe through them. 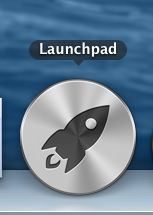 More about Launchpad in the Software section. Safari: web browser (=> Internet chapter). Mail: e-mail program (=> Internet chapter). iMessage: chat program, Apple ID required. FaceTime: video chat program, Apple ID required. Photo Booth: take pictures with the built-in iSight webcam. Try the funhouse mirror effects... iPhoto: import, edit and storage program for your digital photos. iTunes: audio and video buying, playback and convert program, CD / Video player program, and of course the communication with iPod, iPad and iPhone. Thé way to get your Software. You always need a login name and password, a so-called Apple ID. In case you haven't one yet, you will be automatically redirected to make one. Of course you can also use the Apple ID to go shopping in the iTunes store. System Preferences: discussed in chapter Preferences. Trash: seems obvious. To empty, click on the icon in the Dock and hold the mouse button. The text "Empty Trash" will appear. 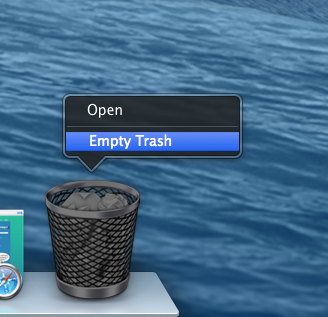 Note that you can also go to the Finder Menu and choose "Empty Trash". 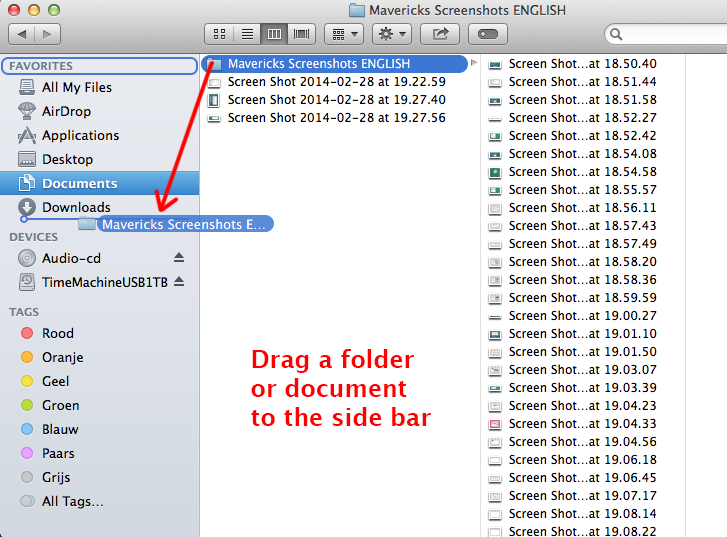 More tips and tricks for the Finder in the Finder Tips chapter!